Habitat: Breeding occurs in a range of wet habitats, from cattail marshes and peat bogs to moist bushy thickets and damp open forests. The Coastal Plain Swamp Sparrow nests in brackish marshes with scattered shrubs, above the high-salinity zones more favored by Seaside and Saltmarsh Sparrows. Migrant Swamp Sparrows can occur anywhere, even on suburban lawns and in city parks, but as in the breeding season, they are most reliably encountered in wet, densely vegetated habitats. Flooded forest edges, soggy depressions in the middle of fallow fields, and swampy marsh edges can harbor particularly large numbers at the height of migration in April and October. Wintering birds prefer the same habitats, and may visit bird feeders when the weather turns suddenly inclement. Such statements exaggerate this bird’s shyness. It is not demonstrative, feeding quietly on wet ground or wading in shallow water, but once seen, it can easily be watched at close range without fear of disturbance. Except when foraging in deeper water, the Swamp Sparrow holds the tail at or just below the horizontal; birds feeding on drier substrates or on the ground beneath feeders often scratch at their food with both feet at once. When flushed, Swamp Sparrows fly low over the ground into nearby cover, where they perch deep in the vegetation, usually out of sight and very close to the ground. The flight is fairly weak, and the tail is often pumped downward, a habit shared with Lincoln and Song Sparrows. Voice: Swamp Sparrows are usually silent in flight, but perched birds give distinctive calls. Corresponding to the Song Sparrow’s cheb or the Lincoln Sparrow’s dtek low-pitched, the rich, musical tcheep is a familiar sound in summertime marshes and winter thickets alike, often the first clue that a mixed passerellid flock includes the species. A hissing, buzzing call, dzree, is very similar to the corresponding note given by Lincoln Sparrows. Oddly, both Audubon and Wilson claim that the Swamp Sparrow does not sing. Males not only climb cattail stalks and bushes to sing but mount to the tips of trees twenty feet or more in height when they are available. With tail down, head high, and bill open, territorial males sing a loud, slow trill, leeleeleeleelee, lasting two or three seconds, the notes bright and musical, each note similar in tone to the tcheep call but usually less sharp. Two trills are sometimes sung on two pitches simultaneously, thus recalling certain of the lighter, duller, softer songs of the Pine Warbler. 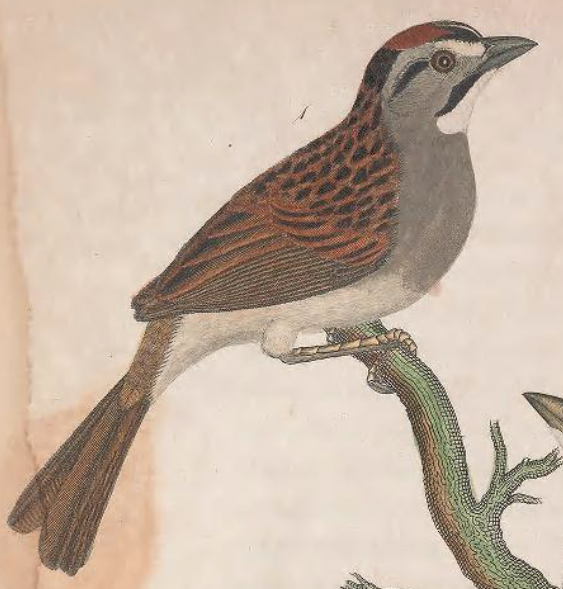 Many males also sing a drier, slightly faster song, reminiscent of a low-pitched, musical Chipping Sparrow’s song. Though singing Swamp Sparrows are most vocal in the early morning, their trills are also a common sound of the nighttime marsh. In many birds, the powerful drives expressed in song can spontaneously flow over into flight. Male Swamp Sparrows regularly, if very infrequently, sing on the wing, uttering a song with “a very different cadence and tonality” from that of the usual song; rather than being a simple variation on the song sung by perched birds, this flight song uses notes that are phonologically distinct from any that make up the “normal” trill. The seven to ten notes of this flight song are fuller, more widely and irregularly separated, and of longer duration than the uniform repeated notes of the trill. This song is given most often early in the breeding season, when territorial boundaries have not yet been firmly determined. On landing, Swamp Sparrows almost invariably follow the flight song with the normal trilled song, which itself sometimes concludes with two or three slower, more liquid notes. Adult, nominate subspecies: Reddish brown tail feathers, the central pair with a dark shaft streak. Upper tail coverts rusty brown with distinct black streaks. Rump olive-brown with dark streaking. Mantle and scapular feathers light brown with black streaks and dull white-buff edges. Primaries brown with paler edges, secondaries chestnut; tertials black with chestnut and buff edges. Greater coverts chestnut with large blackish teardrops. Median coverts bright brown with black centers. Marginal coverts of under wing white. Nape lead gray. Underparts off-white; flanks tawny, averaging brighter buff in winter. The wide jaw stripe and unmarked throat are very pale gray or white, separated by a narrow black lateral throat stripe. Breast, sides of breast, and flanks sometimes with sparse dark streaks. Under tail coverts and vent buffy with fine black streaks. Chestnut crown with or without narrow black streaks. Long, broad supercilium silvery gray, lighter at the base of the bill. Black forehead with short white or gray median line. Light brown-gray ear coverts divided from gray supercilium by well-defined black or chestnut and black line behind eye. Bill dark above, paler yellow-brown below; lower mandible brighter in winter. Tarsi and toes dull brown. Winter adults and formative birds with brown crown and broad gray or brown median crown stripe. Formative birds often with yellow tinge to head, brightest on supraloral; underparts browner, often with extensive narrow black streaking on breast and flank. Juvenile: Breast and flanks buffy with wide, diffuse black streaking. Middle and greater coverts with buffy tips, creating thin wing bars in fresh birds. Back and scapulars with broad blackish streaks. Dark crown with narrow pale streaks.